Saw this and had to share! Mix the three ingredients together. Place in a disposable piping bag and snip the end off or put in a Ziploc bag and snip the corner off. Mix the dry ingredients in one bowl and the wet ingredients in another bowl. Stir them together until everything is moistened leaving a few lumps. Heat your griddle to exactly 325 degrees. You don't want these too cook too quickly, and you won't want your cinnamon to burn. 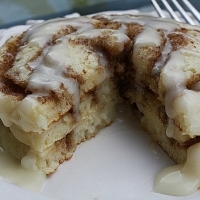 Make desired size pancake on greased griddle and then using the piping bag and starting at the center of the pancake, create a cinnamon swirl. Wait until the pancake has lots of bubble before you try to turn it. You will find that when you turn it the cinnamon swirl will melt. The cinnamon will melt out and create the craters which the cream cheese glaze will fill. In a microwave safe bowl melt the butter and cream cheese and then stir together. Whisk in the powdered sugar and vanilla. Add a little milk if needed to makeit a glaze consistency. Place pancake on plate, then cover with cream cheese glaze.